n the last 10 years, more and more adults in the UK are receiving orthodontic treatment to get that perfect straight smile. Orthodontic treatment has changed dramatically in the past 15 years so have no fear, as the days where the ‘metal mouth’ was largely prominent are now long gone.The Inman Aligner is now becoming well known for being an easy solution to straighten teeth. An Inman Aligner is similar to an orthodontic retainer as it is an easy to remove appliance that aligns front teeth in a quick and pain-free way. It can be used to straighten both the Upper teeth, as well as the Lower teeth. The appliance has Nickel Titanium coil springs that power two aligner bows that gently oppose each other. This generates a ‘squeeze’ effect on the front teeth which gently guides the teeth into alignment. The costing is tailored to each individual person. The average cost for an Inman Aligner in the UK today is expected to be between £1250 and £2500, which is less expensive than traditional braces. Is it comfortable to wear? Will I be able to speak properly? In the first few days of wearing the Aligner it may feel slightly uncomfortable, as your mouth will not be used to wearing an appliance, however after a week it should start to feel more comfortable. Also during the first 2 weeks, you may find your speech has been affected and your mouth may salivate more than usual but this will eventually subside. This is all normal and happens with many people who wear an Inman Aligner. 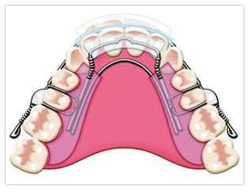 An Inman Aligner is usually a much faster technique than most orthodontic appliances, however the treatment time is down to the individual. When you book a consultation appointment at Abbey Dental practice, the dentist will be able to thoroughly check your teeth and give you a realistic guide on how long it will take to complete. In most Inman Aligner cases, it can take between 6 – 18 weeks. What are the steps after I have had my consultation? If you have decided to go ahead with the Inman Align treatment at Abbey Dental Practice, the dentist will proceed to take impressions of both your upper and lower teeth. This only takes 10 minutes and is very simple and quick to do. Once the impressions have been taken, they will then be sent be a laboratory in London which specializes in custom making your Aligner. When it is ready, we will then contact you to make another appointment at the practice to fit the Aligner. After the fit, you will need to wear the Align for at least 16 – 20 hours a day and you will have to come back to Abbey Dental Practice every couple of weeks so the dentist can check your progress.